This lesson is the culmination of our previous two. Within this lesson, we will apply our knowledge of scales and intervals into the creation of chords. In a way, the previous two lessons and this one as well have been created to provide a foundation of Music knowledge which will be explored and developed in the coming lessons. I know most of the people reading this will all ready know most of this information, for this I apologize. In this lesson, we will also explore Roman Numeral and Macro Analysis. Harmony is the entire basis of Western music. Harmony allows us to propel forward when listening to music and it can stall us and make us feel as if it it not going anywhere. To create this harmony we must understand chords and how they work. It is difficult to define what harmony is exactly, as with what a melody is so one definition I will give you is "the vertical dimension of music". Chord: At least three different tones sounding at once. Triad: Three notes played in unison. The triad is the most famous among all other chords. Triad Root: A root refers to the note on which the triad is built. An example of a root would be F in F Major for the notes needed in this chord are F-A-C.
Four main triads exist, which are as follows: Major, minor, Augmented, and diminished. Below I will show you how to form these chords. Major chord: Combine a M3 and P5. minor chord: Combine a m3 and P5. diminished chord: Combine a m3 and a d5. Augmented chord: Combine a M3 with a A5..
All of these examples show the root, third, and the fifth of each triad. It is important to know that each of the mentioned chords contains a certain stability, which I will list. It is also possible to construct a triad based on its scale degree. When doing this, remember that each name of the triad maintains the name of its corresponding scale degree. For example in the key of B♭ a B♭ major would be known as the Tonic. Primary Triads: The most important chords in any scale are the Tonic, Dominant, and Subdominant. The reason why these chords are considered the strongest is because of their relationship to each other -- a P5 apart. A chord can have multiple positions, which are known as Root position, First-Inversion, and Second-Inversion. Root Postion: When a chord has the root as the lowest note, it is in root position. 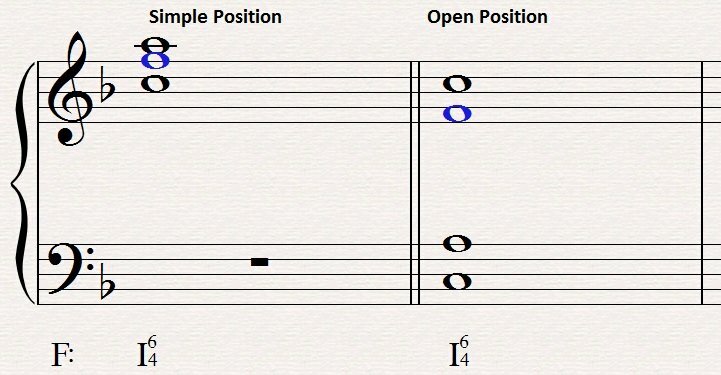 First-Inversion: When a chord has the third as the lowest note, it is known as a first-inversion chord. 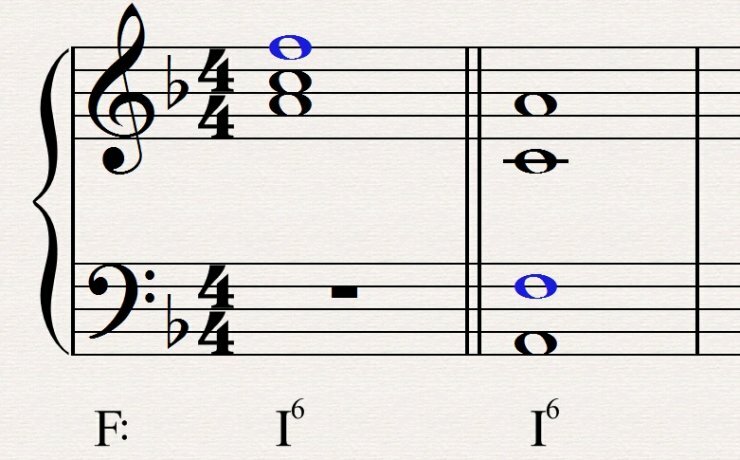 Second-Inversion: When a chord has the fifth as the lowest note, it is known as a second-inversion chord. As you may have noticed in the images above, I marked the root so you can see that the location of the root in the chords. It is important to note that when dealing with four part harmonies that the root simply needs to be present in the chord and not a specific spot when doing a first- or second-inversion of the chord (of course the root must be at the bottom if the chord is in root position). It is important to understand the stability of each of the following chords. When using a root position chord, it has 100% stability in relation to the tonal center; first-inversion chords have about a 70%-90% stability in relation to the tonal center; and, second-inversion chords have about a 50%-70% stability in relation to the tonal center. As you can see, the farther the root is away from the bottom of the chord, the less stable the chord becomes. Don't be afraid of using first- and second-inversion chords because of their stability, or lack thereof. Each of these chords has its purpose in musical literature. Composers and Musicians use first- and second-inversion chords to create a smoother bass line or some other purpose. Extensions: Chords can contain more than the root, a third, and a fifth. In fact, many chords contain addition intervals to create a more interesting sound. For example, a chord might have a M3, P5, and M7 which then becomes a Major Seventh chord. You can constantly create more chords by simply introducing an additional interval(s) to the chord, these are known as extensions. This form of analysis is by far the most popular (especially on this website). To perform Roman Numeral analysis properly, one must understand the relationship between the scale degree and the Roman Numeral. Memorize the following and the examples below. Roman Numeral analysis is also handy when it comes to chord position analysis. When a chord is in root position, no additional symbols are needed to represent it. However, when it comes to first- and second-inversion positions, additional symbols are needed. It is important to label the key when using Roman Numeral analysis for simply putting a I is completely ambiguous, I of C? I of B♭? ; using C: I you clearly communicate to others that you mean the tonic chord in the key of C.
When a chord has its intervals reduced to the closest possible position, it is known as simple position. To notate if a chord is in its first-inversion position, add a 6 to the Roman Numeral. To notate if a chord is in its second-inversion position, add at 6 and 4 to the Roman Numeral. 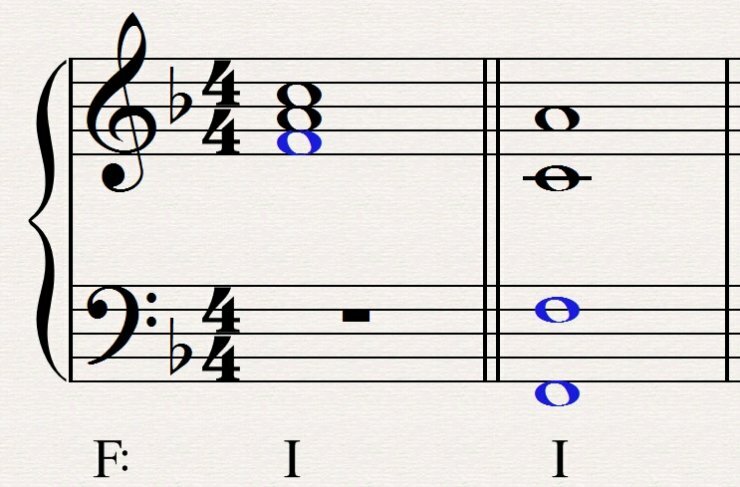 Although 6 and 6/4 are used to indicate inversions of a chord, they are really just short hand for the interval above the lowest sounding note. Seventh-Chord symbols: To indicate if a seventh-chord root position, simply add a superscript 7 to the right of the Roman Numeral. Seventh-chords are interesting for they add an additional inversion, a third-inversion chord. Macro analysis is used to examine and study large scale works. If people use Roman Numeral analysis to understand phrases and periods, then Macro analysis would be used to understand form and pieces as a whole. Macro analysis uses letter names to determine chord roots rather than a numeral, for example, a C major chord would be identified as C rather than C: I. With Macro analysis the reader exposes harmonic movement and duration, with the use of slur symbols whereas Roman Numeral analysis focuses on chord position, a much smaller and subtle detail. When using Macro Analysis remember these rules four rules to identifying a chord. Attach a slur to chords whose roots are a descending fifth or an ascending fourth apart (circle progression). Attach a dotted slur to leading-tone chords whose roots resolve a half step up. Since a leading-tone chord substitutes for a dominant chord, the dotted slur indicates the use of a related chord progression as a substitute (leading-tone progression). At the end of this lesson you should have an understanding of the foundations of music theory. In lesson 02 we went over scales and modes. We learned how to create four basic scales which are as follows: Major, natural minor, harmonic minor, and melodic minor. These four scales are essential in the upcoming lessons for we will learn how to use these scales to create melodies as well modulate from one key to another. We also briefly went over the Church Modes which will provide us a basic framework when we delve into Counterpoint. In lesson 03 we went over intervals and transposition. By knowing our intervals we can effectively communicate with other musicians when we say move up a M3 or start on the fifth. By also knowing our intervals we are able to transpose melodies efficiently and correctly. In lesson 04 we combined our knowledge of scales and intervals to build chords. We found out how to combine certain intervals to create chords. Just remember, these are not all the chords there are to know. The chords we went over in this lesson are basic diatonic chords. To name a few atonal chords, there are the French Sixth, Italian Sixth, German Sixth, and my favorite the Tristan chord (this chord is responsible for the mess that is 20th century music). With this knowledge we will be able to create four part harmonies, change textures of music, modulate to different melodies and create more interesting chord progression. It may take me a while to write the next lesson for I have loads of school work in the upcoming weeks; I am sorry. i want pictures with human fingers placed on the guitar strings to understand best. very detailed and a little overwhelming, but I'll give it a try. I just wonder how much of this theory is necessary or, indeed, even helpful if you want to become an intermediate or even advanced guitarist. When making a Major triad you use the root - the Major third (M3) - and the Perfect fifth (P5). M3 means Major third. It's Major because it's capitalised, if it was "m3" it would be a minor third.